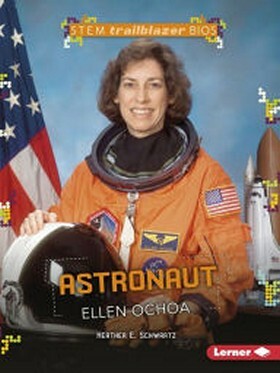 When it comes to a person exemplifying the mission of this book series, STEM Trailblazer Bios, astronaut Ellen Ochoa is perfect. Not only did she pursue her goal of becoming the first Hispanic woman to fly into space, but she also maintained her love of music and became a classically trained flutist. Ochoa followed her dream by choosing to study physics in college, eventually earning a Ph.D. in electrical engineering. When she applied and was accepted the astronaut program, she was able to complete four Space Shuttle missions, earn a seat at Mission Control, and become Director of the Johnson Space Center in Houston. She also owns several patents. Ochoa’s life was not as easy as first thought: She had to work very hard for all her successes, but her perseverance is a lesson to all who have a dream and wish to follow it. Schwartz gives a very good overview of Ochoa’s life, and explains why she should be an inspiration to all children. Upon reading this, everyone will want to learn more about this trailblazer. This book employs a very clear, concise, easy-to-understand format. If other books within this set are as good as this one, then they all will be worth the read.